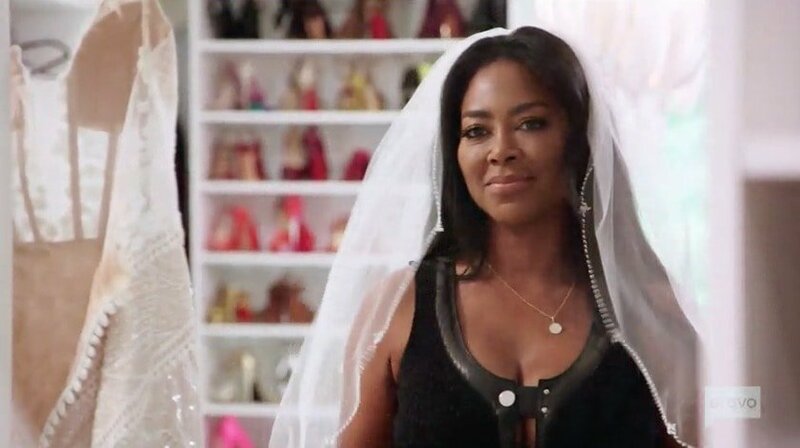 As of now, Kenya Moore’s marriage with Marc Daly is a total mystery. Hopefully she reveals more as this Real Housewives of Atlanta season rolls on, but as of this moment there are more questions than answers. The biggest question that both Kenya’s fans and haters want to know is if this relationship is for real. Photos: Bravo Cameras Spot Cynthia Bailey Hanging Out With Fired Housewives Jill Zarin And Kathy Wakile! Jill Zarin is still dining out on her whole used to be on Real Housewives of New York thing by inviting a host of former and present Bravolebrities to participate in a charity luncheon at her Hamptons home which she has dubbed “Camp Zarin”. The luncheon, which boasted such esteemed celebrities as Patti Stanger, LuAnn de Lesseps, Alex McCord, and Kathy Wakile, raised proceeds for the Samuel Waxman Cancer Research Center. The event was catered by Chef Roblé of Bravo fame as well – and Cynthia Bailey also attended! Wait – she hasn’t been fired – what was she doing there?! See which of your favorite reality TV stars are celebrating a birthday in May! Earlier this week, Bravo announced 18 returning series and 17 new series coming soon to a TV screen near you. We're never going to sleep again. More Bravolebrities than we can process without getting heartburn gathered at Bravo's Upfront party in New York City. We already shared the blue carpet arrivals of the stars of Vanderpump Rules and Real Housewives of Orange County, Real Housewives of New Jersey and Beverly Hills, Real Housewives of Atlanta and Miami, and Shahs of Sunset and Real Housewives of New York. Now we have a group of behind the scenes shots to share. Here’s a roundup of our favorite "Bravolebrities All Mixed Up" pictures from Twitter! Above: Lisa Hochstein tweeted, "Alexia Echevarria, Adriana de Moura, NeNe Leakes, Kenya Moore, and moi at Bravo Upfronts." CLICK CONTINUE READING FOR MORE PHOTOS! PHOTOS – Reality Stars Attend Fashion Week In New York City! There were a TON of photos this week, so we will be bringing you two photo posts! Today, the photos from NYC’s fashion week, and then the regular weekly photo post tomorrow. Also, starting tomorrow, the weekly photo posts will now be on Thursdays! Above are photos of Kelly Bensimon and Cynthia Bailey’s very big hair during this week’s Fall 2012 Mercedes-Benz Fashion Week in New York City! Cynthia is pictured at the Zang Toi show while Kelly attended the Dennis Basso show! More photos of the ladies below! Also below, other reality stars such as Ramona Singer, Alexis Bellino, Alex McCord and Simon Van Kempen, Jill Zarin, Patti Stanger, Snooki & more! CLICK THE CONTINUE READING BUTTON TO SEE ALL THE PHOTOS!